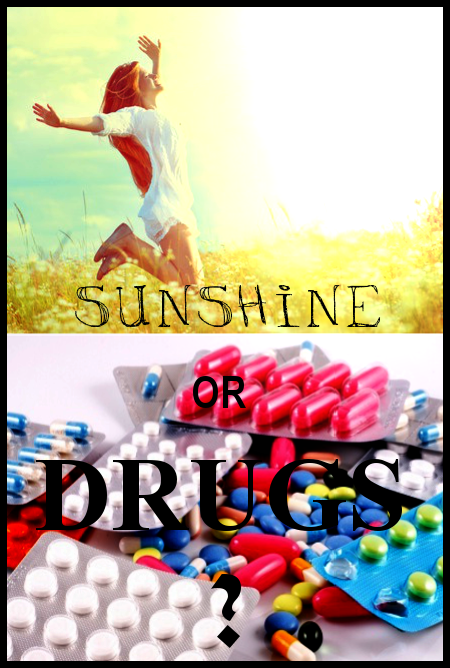 Depression: Drugs or Sunshine, Food, and Exercise? The majority of my patients who have come to me on anti-depressant drugs have been able to get off of them, with the help of some of the following recommendations. Some cases of depression are mostly the result of inadequate perfusion and thus an inadequately functioning brain. One of the best naturopathic physicians and teachers I know, Dr. Kenneth Proefrock, doesn’t usually oversimplify, but he does say, “It’s all about blood flow.” What he means is that blood carries oxygen and nutrients, which are absolutely, can’t-live-without-them, essential for all parts of the brain and body, including the repair of things that go wrong there. In “Breaking the Age Barrier,” authors Wassef and Torkos claim that by age 50 blood flow to the brain has dropped by about 20 percent. Arterial plaque in the vessels that supply the brain, the carotid arteries, narrow the diameter of these blood-giving vessels, which reduces the flow, and thus reduces the brain’s best advantage for full-functioning. Thus we end up walking into a room only to find we’ve forgotten what we came in for, or can’t think of something we recently learned. The depression most characteristic of middle and older ages revolves around the concern for what brain function is becoming lost. The brain is especially sensitive to any deficit of blood flow and the nutrients carried by blood. This is why one of the first symptoms of inadequate blood sugar or oxygen is grogginess, headache, dizziness, irritability, etc. The brain is the most dependent on and therefore the first to complain when any of the essentials go missing. In the absence of adequate oxygen the brain dies in a few minutes or suffers irreversible damage. To a lesser extent, remaining in a stuffy indoor environment makes us a little dopey. During the summer thunderstorms and at cooler times of day, crack open a window now and then. Sunlight arrives to the brain by means of the eyes. So try to get some outdoor time with unfiltered light. The natural light received by the eyes plays a vital role in body and brain chemistry. The light received by the eyes influences the hypothalamus, which in turn influences the pituitary and pineal glands. The pineal gland especially is involved in our diurnal rhythms, and our lack of quality light through the retina may be the source of many sleep disorders that are increasingly common among people who are always indoors. Disordered sleep is one of the first signs of depression. Much research on this subject is summarized by the German ophthalmologist Fritz Hollwich, MD  as well as by John Ott, Hon. D. Sci. a researcher on the properties of light. The array of bodily organs and systems that depend on full-spectrum light through the eyes is astounding. When the eyes are exposed to natural sunlight or full-spectrum light, the pituitary gland, thyroid gland, adrenal glands, ovaries, testes, pancreas, liver and kidneys all function better, according to the numerous studies presented in these two books. Full-spectrum light includes a balance of wavelengths from all colors of the visible spectrum plus ultraviolet and infrared. On the other hand, cool white fluorescent bulbs, which are now used for the great majority of interior commercial lighting, have strong yellow, but are very deficient in most of the other wavelengths, with no ultraviolet or infrared. Unfortunately, however, UV light has received a bad name, primarily because of individuals who have a history of blistering sunburns followed by skin cancer. There has never been any research showing health benefits of blocking UV light to the eyes. However, it is now impossible to buy eyeglasses that allow full-spectrum light. All of the lenses made in the last ten years for eyeglasses are made to block UV light, even plastic lenses, which if untreated, allow full-spectrum light. Earl Staelin, writing in the Well Being Journal, summarizes the recommendations of those who have studied light and its health effects, and recommends that individuals who must wear glasses try to get outdoors everyday for 20 to 60 minutes or more without wearing any glasses, because the amount of UV light that strikes the retina from around the edges of glasses is insignificant compared to the large amount of light coming through the eye through the lenses. The full spectrum of daylight need not come from direct sunlight, but is available also on a cloudy day or under the shade of a tree or porch. Glass windows however, do block out UV light, so try to get out in the fresh air if at all possible. For an especially busy person, eating your breakfast outdoors, weather permitting, may be the only option. On days when even this is difficult, there is yet another recourse, which is distilled cod liver oil. The distillation takes out mercury and other heavy metals, which are all too prevalent in both salt and freshwater fish. Cod liver oil is high in vitamins D and A. Just 2 tablespoons a day has been found to completely eliminate psoriasis, a disease that conventional medicine only knows to suppress with steroid drugs. However, for your optimal intake, depending on your sun exposure and weight, you should really check with your naturopathic physician. The importance of exercise to overall health cannot be overemphasized. It has been pointed out that an athlete who eats junk food is better off than a couch potato who eats the healthiest possible food. (For a worst-case scenario, a couch potato who eats junk food is diabetes and stroke just waiting to happen.) As vital as good food is to health, exercise is even more essential. It’s pretty much a choice of move or slowly die. In a study of 18,000 women it was found that greater physical activity has been associated with less cognitive decline. That’s a lot of women! It doesn’t get much more persuasive than that. Exercise also releases endorphins, the body’s own “feel-good” chemicals. Considering the very physically active lifestyles our distant ancestors had, it is probably not such a bad or dangerous idea to get some more of these “feel good” chemicals flowing through our brains, at least a bit more than today’s sedentary people have in circulation. It is almost impossible to be depressed with a rigorous exercise program. You’d have to try hard, always stay indoors and only eat junk food. People who are socially isolated are more likely to have dementia and depression, and begin to suffer from those at a younger age than those who are involved in social or family interactions. Stay involved or get involved. Some people say college is wasted on the young, because too many other distractions early in life can obscure the great value that is possible to obtain from a college education. Continue learning new things throughout your life, and make yourself continue to remember what you learned, whether through review or incorporation into your other activities. Studies have shown that people who maintained more mental activity through learning and social interaction had lower incidence of Alzheimers. Another quote from Dr. Proefrock: “Self-improvement is the best anti-depressant.” Education gives you something to shoot for, to aspire to, to look forward to and to work and plan for. If your brain is not supplied with proper nutrients, it cannot be expected to function any better than a poorly nourished body. You know what I’m talking about, because it’s just like your grandmom told you: eat your vegetables, some raw. Get fresh fruit. Have some meat or other good quality protein like rice and beans. Don’t eat dessert. Sugar is one of the worst culprits in depression. Giving up sugar alone will usually get people out of depression. Children diagnosed with depression, when advised that if they stop eating sugar their depression will go away, usually rise to this challenge and heal themselves naturally without drugs. Grant your children this learning experience if they are already suffering from mood disorders. The above are some of the basic essentials for good brain function and good mood. Medications: Over the counter and prescription medications have been notorious for decreasing optimum brain functioning. The same mechanisms that stop transmission of pain signals and other symptom awareness are also capable of interfering with thoughts and emotions that also transmit via neurons. Alcoholism – with continued drinking to the point of addiction, the option to drink in order to place one’s worries aside is less urgent than getting a drink to quench the craving. Alcohol is toxic to neurons and causes lasting as well as temporary disablement of thought, speech, coordination, judgment and mood regulation. Heavy metal exposure: Lead, mercury and aluminum are common toxic metals that many of us are storing in our fat cells. Since the brain is 60% fat, we keep these poisonous chemicals there, tightly bound to our fat cells. Your naturopathic physician can chelate out these metals, which brings your brain function back to levels unknown for even years. Vitamin B12 deficit: This is a common deficiency because it is absorbed in the intestines, which are not at optimal functioning in most people. Your naturopathic physician can correct this very easily with a shot of B12 and folate (the most commonly deficient nutrient), along with a repair program for your intestines. The shot takes less than a minute and feels less ouchy than even a mosquito bite. Metabolic diseases, including diabetes, thyroid disease or other pathologies involving the liver, kidneys or lungs. The brain is most sensitive of all organs to losses of nutrients, oxygen and blood flow, and the most vulnerable to interruptions in circulation or airflow to the lungs. Inflammation from any cause that results in general nervous system inflammation can impede the flow of information processing in the brain. Get what you need and take out the garbage. Your naturopathic physician can test you for excessive amounts of brain-depleting substances, such as candida or heavy metals. There are also lab tests that they can order to determine if inflammatory processes are at work in your body. There are ways of determining if arteriosclerosis is a problem that interferes with blood flow to the brain. ADHD, depression, anxiety, substance dependence, chronic fatigue and fibromyalgia can all manifest with symptoms of brain fog, and all of these are usually greatly improved by naturopathic medicine. 5-HTP helps make serotonin, which is one of the brain’s “happy” neurotransmitters. Depressed people often have low levels of serotonin. Prescription anti-depressants don’t help this situation much, because it takes those low levels and keeps them in circulation more. What 5-HTP does is actually increase your serotonin, because 5-HTP is a precursor to serotonin. You will see this at your local health food store, but it is best if you see your naturopathic physician before starting this, because you might not be low in serotonin at all, but rather another essential neurotransmitter. And that would require a totally different treatment. Other supplements, fish oil or cod liver oil (now flavored with lemon which makes a spoonful much more tolerable), ginkgo, B-vitamins, and Acetyl-L-carnitine are all wonderful for brain function and can be found in health food stores. Fritz Hollwich MD. The Influence of Ocular Light Perception on Metabolism in Man and Animal. Springer Verlag. New York. 1979. John Ott D. Sci Hon.. Health and Light. Devin Adair Co. 1976. Next:Breast Thermography Over A Mammogram?